Not everyone can get their shopping done early. These 27 gifts are guaranteed to please your favorite prepper. Best of all, they will be delivered before Christmas, but you have to hurry! It seemed like yesterday we were wishing each other a Happy Thanksgiving, and now half of December is gone. 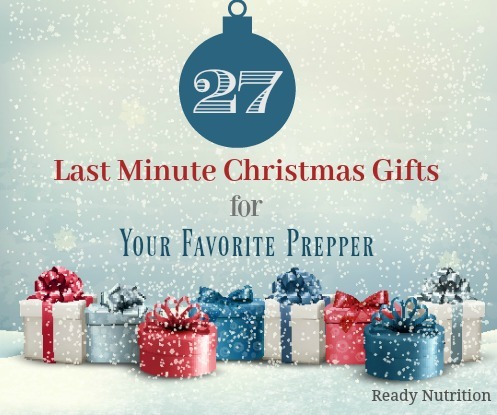 If you are stumped on what to get your favorite prepper or are shopping at the last minute, these gift ideas could be what you’ve been looking for. I like to focus prepper gifts on striving to enhance a prepper’s skillsets or helping one acquire the equipment they need to live in a long-term off-grid environment. If none of these gift ideas strike your fancy, check out Lehman’s or Real Goods. Both of these stores cater to off-grid living and have a huge amount of products to choose from. Check out Real Goods preparedness section – you’ll love it! As well, don’t forget about the importance of reference manuals for the prepper library! Here are some of the top books (Warning: a shameless plug is ahead). All of these gifts are guaranteed to delivery before Christmas, but you have to order them soon. Merry Christmas and Happy Shopping to all of you!